While doing some work around the house, I fell off a stepladder. I landed on my shoulder and hit my head on the wall, which jerked my head sharply to one side injuring my neck. The shoulder got better on its own, but my neck never did and in fact progressively became worse. In addition to neck pain and stiffness, I began having radiating pain into my chest if I looked up, and into my back if I looked down. The pain was barely tolerable and would radiate from the front of my chest from beneath the sternum through to my back beneath my right scapula. I was also unable to turn my head from side to side without causing a lot of pain. Debbie did a Reconnective Healing session on me for about 30 minutes. Within about 15 minutes, the stiffness in my neck began to dissipate and by the end of the session the pain was reduced from a 9 to about a 3. For the next 24 hours the pain and stiffness continued to decrease. As of this writing, I have not had any recurrence of the pain or stiffness. Thank you Debbie! I had been working at a new job for less than three months when I became very ill with what I believe was a kidney stone. I had a tremendous amount of abdominal pain and was unable to straighten up. I scheduled a Reconnective Healing session with Debbie and we agreed that she would do it remotely so I wouldn’t have to wait for an appointment. The remote session lasted for about 40 minutes. I thought I was able to discern the presence of the energy in the room while she was working on me. She called me when the session was over and I was very happy to tell her that though I was not yet 100% back to normal, the pain had lessened to the point where I could get dressed and do things around the house. For the next 12 hours or so, I continued to improve and was able to return to work the next day. I had made an appointment with my doctor and expected that I would have to have a CT scan; however it became unnecessary due to my rapid and continued improvement for the next couple of days. I have not had any issues or pain since. Thank you Debbie! I was having sharp pains in the corner of my left eye and it felt as if I had an eye infection. Debbie did a Reconnective Healing session on me, concentrating only on my eye. After approximately 15 minutes, the pain had lessened but had not completely gone away. The next day the pain was almost gone and it was completely gone by day three. I have not had any problem like that since. Debbie provided this treatment on the day before my wedding. I was suffering from sinus congestion, fatigue and headache. During the session, I could feel my symptoms dissipate and I instantly felt better! My wedding day went without a hitch. I felt great! Deborah HInds, The Reconnection, LLC. and anyone associated with this work, inclusive of, but not limited to The Reconnection® and/or Reconnective Healing ®, make no specific claims, promises or guarantees, and are neither diagnosing nor treating any specific health issues. You are entirely responsible for obtaining and/or continuing your medical care with appropriate licensed healthcare providers. Please do not change or discontinue any medical therapy without first seeking the advice of your licensed physicians or providers. When providing this work, Deborah Hinds is serving only as your practitioner of Reconnective Healing® and not as a medical provider. I was working and helping some colleagues with inventory of a retail store which required us to move some heavy 5 gallon buckets full of paint. I must have moved wrong or something because I twisted my back in the process and immediately began having sharp pain in my lower back. The pain radiated down my right leg. I have had sciatica before, so I know nerve pain when I feel it. Debbie did a Reconnective healing session on me that very evening and after only 10 or 15 minutes, the pain in my back and the pain radiating down my leg was completely gone! I have not had the pain since! ​​​David H.
Eileen is a middle aged woman who is blessed with many talents, one of which is installing floors! Yes, you read that right; she installs floors, as well as bathrooms, kitchens, carpet, and pretty much anything else you might need installed or fixed! The problem is, she finds knee pads cumbersome, so she doesn’t wear them. I have known her for years and she attended one of our family gatherings where she showed me her knees. 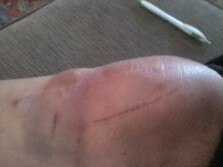 They looked very painful, all banged and bruised, with cuts and scrapes. The right knee had a very large unsightly and painful lump that was so large it showed through her pants. When she showed it to me I asked how the heck she got that and that is when she confessed to working without knee pads. She said she had been to the doctor about six months prior to this and he had drained it and treated it with steroid injections. It didn’t help one bit. I asked her if I could do a Reconnective Healing session on her knee and see if that would help, and of course she agreed. I just did it very informally right there in the kitchen with everyone around. No one paid us any attention, since my family are used to seeing me waving my hands around and over people. I didn’t think to take any pictures at that time, but the lump was very tall and stuck up about an inch. You could clearly see it through her pants when she stood straight or especially when sitting, and she was self-conscious about it. After working on her for about 15 to 20 minutes I could tell that was all that was needed. (With this energy, you can tell when it is time to stop. Most sessions last anywhere between 20 to 30 minutes, but I have done some that took as long as 45 minutes.). She called me the next day and said it was reduced by about half! She was so excited since after six months the medical treatment she had gotten still had not made a difference! She sent me a picture of it (below left)and I was quite pleased with the results. The following day she called me again and said it was completely gone! She sent me another picture (below right). I just spoke to her on September 19, 2016 to ask how the knee is doing and the lump still has not returned. I still asked her to wear knee pads next time she works on floors! Eileen's knee day 2 after her initial healing. You can see the swelling and the lump are completely gone! She has had no recurrence as of this date! 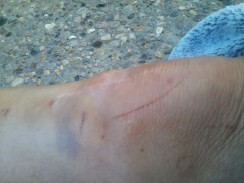 Eileen's knee one day after receiving a healing session. When I took the first class in Philadelphia in 2009, I didn’t know what to expect. I was already experiencing the profound vibrations that accompanies the sudden activation of the energy. I was at the class to learn what to do with it and how to help others with it. There were approximately 250 to 300 people in this class. The format was a mixture of lecture and hands on practice. The hands on part consisted of 5 people to one massage table with one person laying on the table and two others on either side of the “client” who would get a practice healing session from all four students; after a few minutes we would switch so everyone could have a chance at both roles. We were divided into groups in several different rooms. After about an hour of practice, we suddenly heard some very loud sobbing! I am always alarmed when I hear someone crying very loudly like that, but we couldn’t see what was going on so we just continued with our practice session. One of the volunteers came into our room and told everyone that no one was hurt and we should not worry about what we heard. Curiosity was about to get me, for sure. After a while we went back to the lecture hall and Dr. Eric Pearl, the founder of Reconnective Healing, went up on stage to address what had happened. He told us that the purpose of the practice sessions is not to heal any particular student, but it does sometimes happen. One of the students, a young woman who looked to be in her early 30s, received a spontaneous and quite remarkable, miraculous I might say, healing of a fused ankle. Keep in mind, we were in a practice session, so her “healing session” only lasted a few minutes! According to the story she told, she had broken her ankle at the age of 15 and it had been fused ever since. She could only wear walking or running shoes and really missed being able to wear beautiful feminine shoes and especially high heels! If you have ever worn heels and felt pretty wearing them, you can relate to what it might feel like to never be able to wear them again. You ladies with the shoe addiction, you can relate. You know who you are! I can certainly relate! Dr. Pearl had her demonstrate for us how she could now stand on her tip toes with no pain. With a fused joint, that would literally be impossible! It was at this same training weekend that I was on the practice table with the other four students around me and I had my eyes closed. While they were doing their healing work on me, I felt someone gently touching my side, just below my rib cage. We did not know each other and so I knew that none of the other students would be touching me, but there it was, I could feel it. When they gave us the queue to switch and I rose from the table, I asked if anyone had touched me, and they all said “no”. I had been having some digestive issues. My doctor at the time gave a diagnosis which would require removal of my gall bladder, but I wouldn’t allow it. After that day I have not had any gall bladder problems! I am so glad I didn’t allow my doctor to remove it!